The Brenton Blue butterfly Orachrysops niobe was first discovered during a visit to Knysna in 1858 by Roland Trimen, curator of the South African Museum in Cape Town. 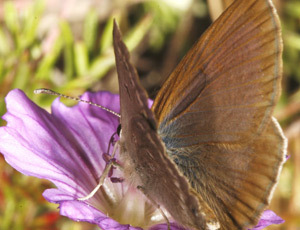 It was not seen again anywhere else until it was found again at Nature’s Valley in 1977 by Dr Jonathan Ball, a Cape Town radiologist and butterfly expert. Unfortunately, the butterfly had disappeared from Nature’s Valley by the late 1980s, as more and more houses were built there. Ernest Pringle, an Eastern Cape farmer and butterfly fundi as well, discovered the location of the colony at Brenton-on-Sea in November 1991 (following earlier sightings by Dr Ball). This colony is the only known remaining place where this butterfly occurs, despite intensive searches along the Southern Cape coast by many butterfly experts (lepidopterists). Since there were plans to develop residential properties on the site of this newly discovered colony a “Campaign to save the Brenton Blue” was launched in 1994. The campaign was coordinated by a management committee made up of all the conservation minded organisations, and eventually led to the proclamation of the Brenton Blue Butterfly Reserve in 2003. Even before this proclamation, scientists were conducting research into the ecology of Brenton Blue, and this has led to a deep understanding of the natural history and ecology of the Brenton Blue, which has enabled the reserve to be managed to sustain the Brenton Blue populations. For those who wish to read and learn more a full list of all the publications on the Brenton Blue can be found here. The Brenton Blue butterfly reserve is also home to many other butterflies, an amazing variety of fynbos and thicket plants, which attract the presence of many birds and mammals. To see the latest news regarding the Brenton Blue Butterfly click here. To read the latest newsletter about the Brenton Blue butterfly, click here.